Rub Al Khali is one of the largest deserts in UAE as well as in the world. The desert territory is shared by the Arab nations of Saudi Arabia, the United Arab Emirates, Oman, and Yemen. In Arabic “Rub al-Khali” means empty quarter. The desert of Rub Al Khali is the location of several adventure sports and activities. The desert mainly attracts tourists from western countries who are drawn by the mystic beauty of the desert sands and the thrill related to desert safaris. Adventure enthusiasts can indulge in exciting dune driving and sand skiing here. Desert safaris are the most popular excursions from Abu Dhabi and are the best way to explore the sea of sand at Rub Al Khali. Feel the essence of Bedouin hospitality and culture while enjoying an overnight stay at the Bedouin tents. Join a day trip across the Manazir Plateau and Al Hamra Sands to see the scenic dune formations and experience a camel ride. Exploring the vast desert of Rub Al Khali, Abu Dhabi, is much easier now with air-conditioned 4-wheelers or the traditional means of transportation, camels. Yet it is not possible for all to cross the sea of sand, and discover the several oases that lie within. As the desert is smaller than the Sahara desert, it has about half as much as sand as the Sahara desert. 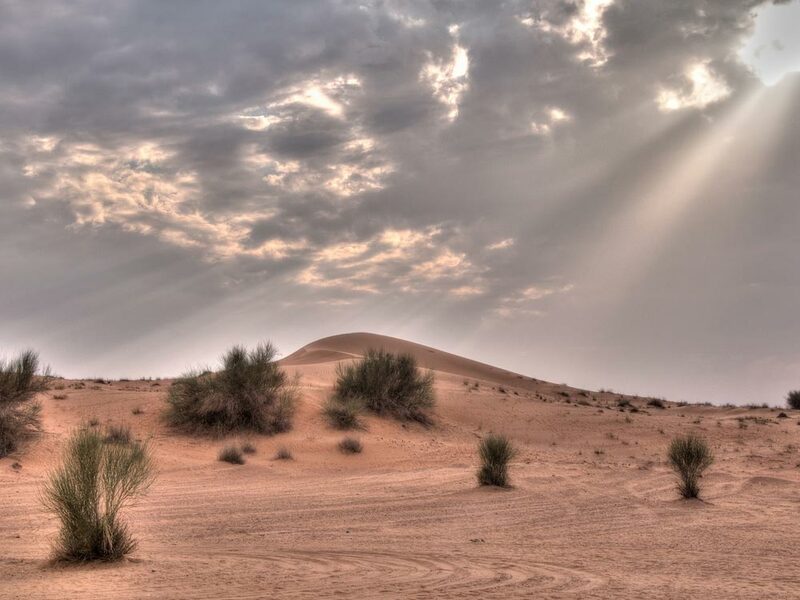 The northern part of Rub Al Khali in Abu Dhabi is watered by occasional winter rains, while the southern part is sustained by monsoon rains from the Indian Ocean. The northern region is the home of Al-Murra and al-Dawasir Bedouins. Their camels feed on bushes and grasses that grow in the northern desert. Other tribes that roam in this desert are Al-Manasir, al-Duru, al-Kathir, al-Rawashid and the al Manahil. Fauna in the desert comprises of arachnids (e.g. scorpions) and rodents. The desert is dotted with plants at various places. Where is Rub Al Khali? The Rub Al Khali lies about 172 kilometers from the city of Abu Dhabi and it takes more than a two-hour drive to reach the desert. You can also get to the desert from the countries within which the desert extends. For ease of access it is recommended to choose either UAE or Oman to begin your journey. If you choose to travel through UAE, you would require to get to the Liwa Oasis in the Arabian Quarter through Abu Dhabi. In case you choose to travel via Oman, you will need to take a flight to Salalah and drive through Jabal al Qara to reach the lost city of Ubar. The Rub Al Khali desert spreads over an area of 600,000 square kilometers. The sand dunes at the desert reach upto 250 meters in height. The Rub Al Khali desert is the world’s most oil-rich place. In 1948 the largest oilfield in the world named “Al-Ghawār” was found in the desert. On 4 February 2013, a South African team comprising three people viz. David Joyce, Alex Harris, and Marco Broccardo became the first people to cross the Rub Al Khali desert on foot. The best time to visit Rub al Khali desert is during the winters, as in the summers the temperatures reach 50 degrees Celsius. Places to visit nearby are: Oman, Yemen, and Dubai.